A dear friend of mine is soon going to be relocating from Hyderabad to Bangalore and I'm thrilled. I visited Hyderabad last year and I found it to be a very beautiful city. I stayed in Banjara Hills, one of the most poshest residential areas of Hyderabad and the place was excellent. And so was the weather. We visited during July and the weather was uber pleasant. It reminded me of Bangalore in more ways than one. So I want to make sure that my friend doesn't miss her city much when she moves here. I'm sure no city holds a candle to Bangalore. For me, without a doubt Bangalore is the best place to live in. This city has everything that one could need and experience. And I will do everything I can to make my friend's stay here as smooth and comfortable as possible. She is shifting here for a year or two, so, everything needs to be sorted for her as quick as possible. She would be staying with me until she settles down, and she needs everything for her at one place only to avoid all the running around. And that is when I recommended Quikr to her, so that she can set up her own house quickly. The first thing that she would need is a house. I know there are a lot of real estate sites in India now, but the easiest way to find a house now is on Quikr. There is nothing else that I would recommend for this. You do not even have to sign up with Quikr to use their features. On their home page you can see all the amenities that they offer. The 'Real Estate' option provided by Quikr allows us to choose apartments for rent or to buy. You can narrow down your options by choosing the number of bedrooms you need along with the furnishing i.e, fully furnished, semi furnished or unfurnished. Even if you like an unfurnished house, go for it without hesitation. For furnishing the house too I would only recommend Quikr. Since her job involves a lot of travelling, she might have to move out to a different city again. Why invest in brand new goods just for a while? While leaving the city she would have to sell these off at throwaway prices. So instead it is better to pick furnishings from Quikr and while moving out she can sell it back on Quikr. Easy, ain't it? Her office is going to be in Electronic City but she wants to stay in and around my place in Indiranagar. Both are like different ends of the city. The travel is going to take a toll on her, but her office would not be providing transport. I recommended Quikr to her, to solve this problem as well. Quikr offers wonderful deals on cars and bikes. The deals on Quikr are directly from seller to buyer without a third party in between, making it easy and smooth. All one has to do is search for a preferred vehicle, view the pictures, get the contact information and talk to the seller directly. You can check out four or five sellers before narrowing it down to one. It is really simple and quick. Once you are done with using the vehicle, click a picture of the car and post a free ad on Quikr. It will get sold almost immediately, I assure you. So house done, vehicle done; all thanks to Quikr. The reasons for which I would recommend Quikr to anyone who is moving to Bangalore are plenty. First, this is a one stop destination for all your relocation needs. From houses to furniture, and cars to electronics, everything you can find here. All one needs is to visit the website or the app, have some patience and search for their required items. Incase you have a pet and are new to Bangalore, you can even find the details of pet care facilities here. However, the best ever feature on Quikr are their 'Services' section. This section offers details on everything that one needs when moving to a new city. You can find contacts of interior designers, baby sitters, beauty parlors, plumbers, electricians, cooks, maids, household repairs and almost every other service under the sun. I have never seen this in any other site before. My friend and anybody else who is moving to Bangalore, can get all the help and information they need under this one quick site called Quikr. Another reason I recommend Quikr is because it is a site with a heart. Why, you ask? They have a section called 'Lost and Found' where people post information of things they found or lost along with the details of the item and their contact number. In this way, if not all atleast some items can be returned to the rightful owner. I was surprised to see such a feature on an Indian site! 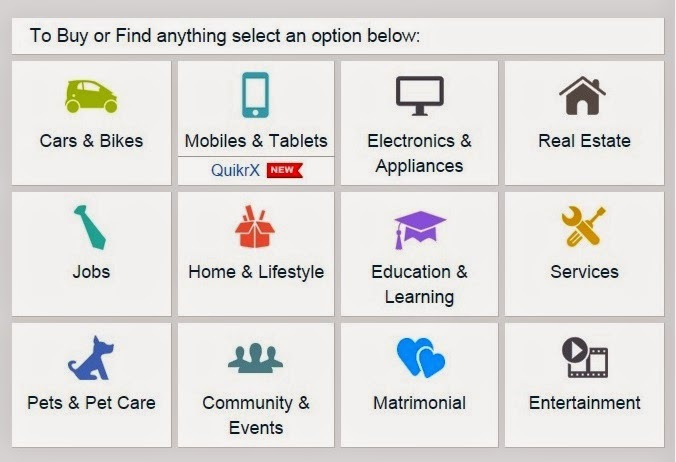 Quikr even has a matrimonial section where you can search for life partners. Didn't I tell you before that this site is the one stop destination for everything that you need. Partner included. A site like this helps even a layman to get hold of things that they need when they move to a new city. Some people might hesitate before buying used items, but you can check the item out before buying as you can directly deal with the seller. If not convinced, you can choose not to buy it. It all lies in the hands of the buyer. I have already recommended bangalore.quikr.com to my friend and she is almost half settled here now. I would close my eyes and recommend bangalore.quikr.com to anyone who is relocating to Bangalore. Having said that, Quikr even has details of packers and movers so that you can bring your existing items from the city you are moving out from. What more does one need and why should I not recommend this? I have a million reasons to recommend this to my friends and to anyone else who is locating to Bangalore and I will continue to do so. This post is written as an entry for Indi Happy Hours - It's just Quikr in Bangalore! activity in association with Indiblogger and bangalore.quikr.com.